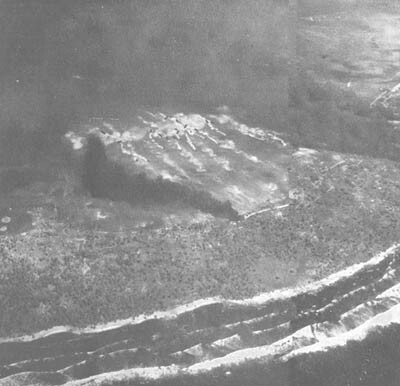 WHEN THE LANDINGS ON THE RED BEACHES were known to be progressing without significant opposition, the 2d BLT at 0856 moved to the second transport area, west of Kotabu Island. The Neville, with its boats already lowered, the LSD Belle Grove, and the LST 179 carried the troops, tanks, and Alligators for Yellow Beach. The Belle Grove launched the LCM's carrying medium tanks (and two LCVP's) between 0910 and 0923. 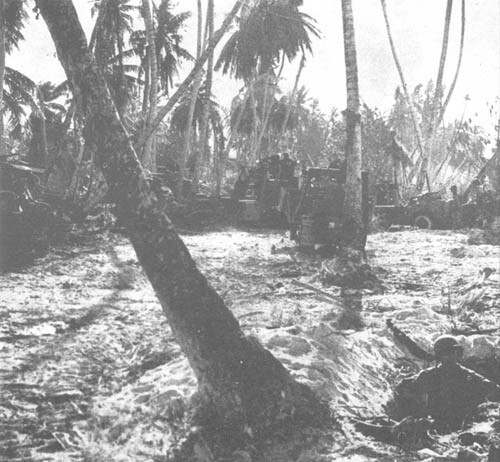 The LST 179 continued to the third transport area within the lagoon and there launched the 16 Alligators which carried Special Detachment Z of the 105th Infantry; they faced the most hazardous mission of the Yellow Beach landing force. Behind them the landing craft formed waves, started passing through the channel between Flink Point and Kotabu Island at 0952, and crossed the line of departure at 1012. From there to the beach the course ran east-southeast for about 6,000 yards, bringing them into the area between On Chong's Wharf and King's Wharf after a run of 18 minutes. One of the Alligators ran up the seaplane ramp on King's Wharf to discharge its passengers, who made their way inland by crawling along the rough western slope of the causeway out of range of the fire which swept over its top. (See illustration, p. 55.) Another developed a defective steering device and landed to the right (west) of On Chong's Wharf, so that its men dismounted there and worked their way to the left. The other Alligators swept up the beach. 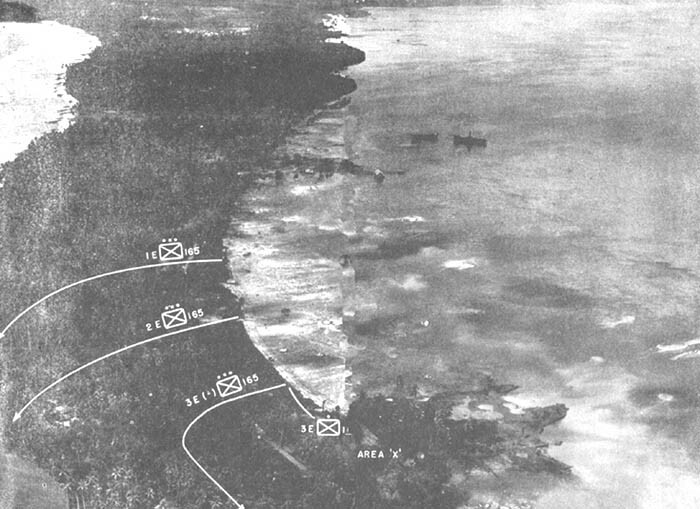 Three entered the cove east of the sandspit and swerved to the left; a fourth landed on the tip of the sandspit, wandered alone among the trees and ruined buildings, and likewise swung to the left; and another swung across the base of the sandspit from its western edge to join those gathering on the left flank of Yellow Beach. 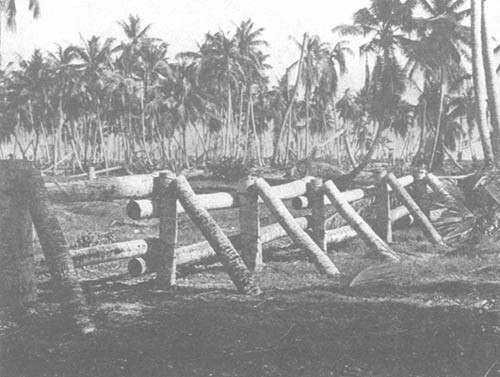 One Alligator went completely out of control and continued across the island toward the ocean through the heart of the Japanese defenses. It stopped only when it hit a shell crater so large that it came to a jolting halt, nose up. 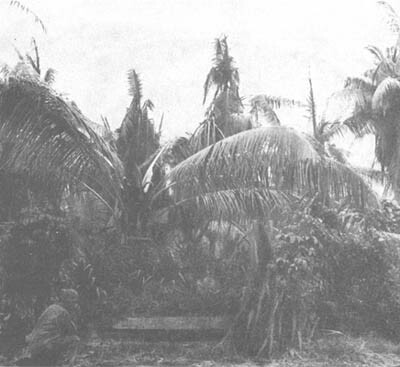 Japanese rifle and machine-gun fire killed two men while others successfully took cover outside. The remaining nine Alligators crawled up the beach to the shoulder and stopped for the men of the two details of Special Detachment Z to jump down and hurry to the flanks. 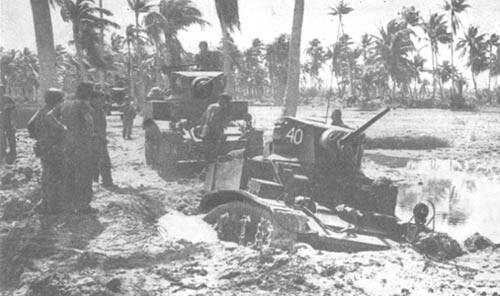 Shell fire struck 2 of these vehicles, and among the dismounting men 5 were killed and 12 wounded during this part of the action. The intensity of enemy fire increased. Some of the men crouched; others tried vainly to run; but most of them strode forward upright. (See illustration, p. 60.) Struggling forward in water sometimes knee deep, sometimes up to chest or chin, and often stumbling into underwater shell holes, the men could make no speed. Radios, flame throwers, bazookas, and other equipment became soaked or lost. Although the men were rather closely bunched in the water, they escaped with surprisingly few casualties. Only three were killed. At the beach the men of Companies E and F divided. 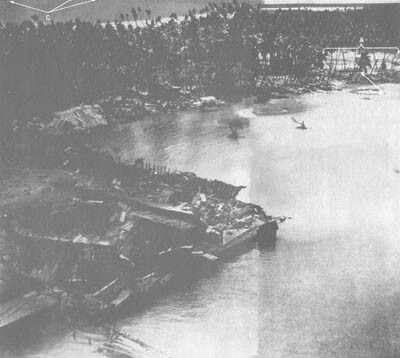 just as they reached dry shore, at about 1053, a pile of gasoline drums went up with a terrific explosion, raining metal fragments over a wide area of the lagoon. The men hesitated, then rushed across a 15-yard strip of sand and hit the dirt where the vegetation of the upper beach afforded a little cover. There they waited while Alligators and tanks cleared the beach to the flanks and enemy fire diminished. Behind them, two minutes later, the fourth wave infantrymen had an experience very similar to theirs. 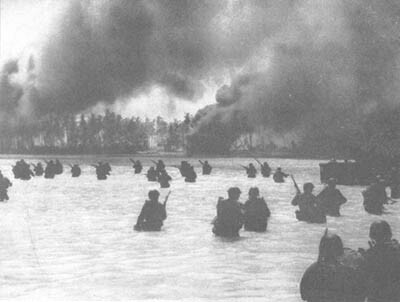 In the first few minutes of the landings the Alligators and the right wing detail of Special Detachment Z went rapidly toward the base of On Chong's Wharf. The riflemen then moved across an area from the beach to a point about half way across the island, pivoting on the base of the wharf and swinging to the right. Most of the squads met opposition only from snipers instead of the machine guns which they had been warned to expect. 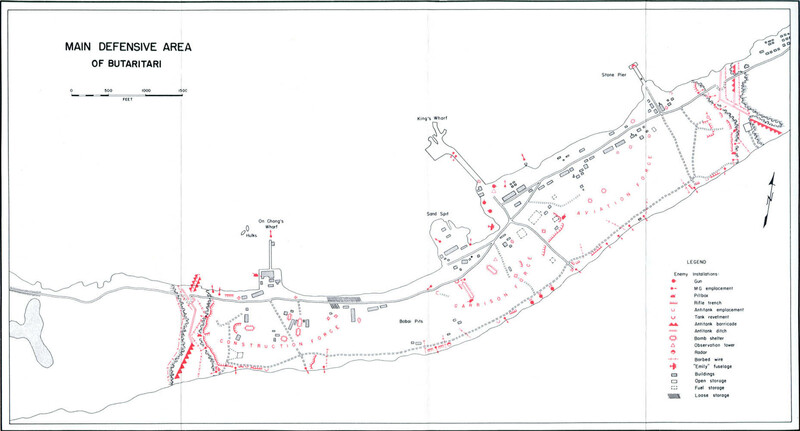 About 100 yards inland some of the attacking force encountered large, deep, reverted shelters (Map No. 9, inside back cover). They threw in grenades and, in addition to killing about 20 Korean laborers, took more than 30 prisoners among those who ran out. None of the shelters was entered, so that later in the day some enemy may have emerged to harass the rear. 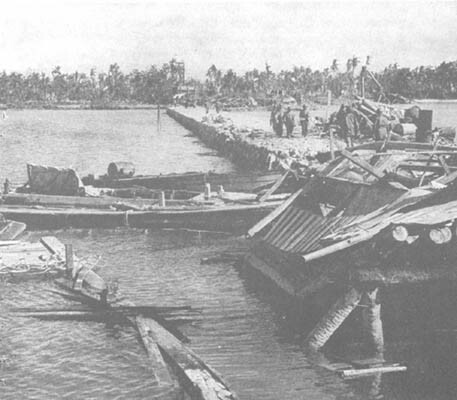 Two machine-gun positions and seven wholly or partly demolished buildings were found on the base of the wharf, all abandoned by the enemy. About 450 yards east of the division beachhead line at "Jill Lake" and again some 700 yards farther east, at the second American phase line, the enemy could have set up positions easily covering the firm ground (Map No. 4, p. 13). 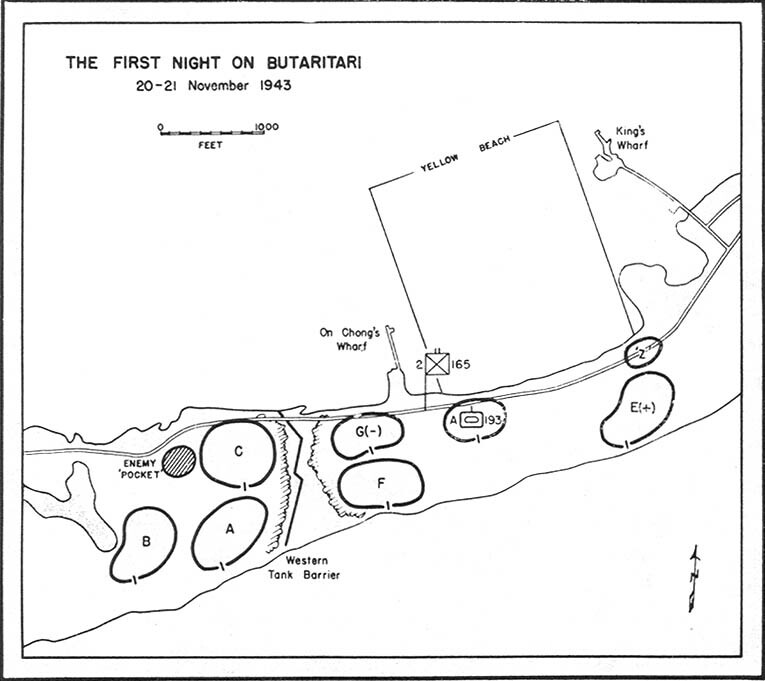 The first of these opportunities bad been taken; two machine-gun positions and an antitank-gun emplacement commanded the highway while fire trenches and another machine-gun nest covered the ocean shore and the area immediately to the north of it. But the enemy did not use these works to resist the advance of the 1st BLT, and had not even erected any fortified positions at the second phase line. The light tanks had not come forward with the 1st BLT beyond "Jill Lake," for in the highway between that pond and another, just north of it, a naval shell hole engulfed the leading tank of the column and acted as a thorough road block. (See illustration, p. 76.) The highway at that point was a causeway from which the other tanks could not depart to bypass the first one. It was necessary to extricate the semi-submerged vehicle and to fill up the shell bole before the column could proceed. 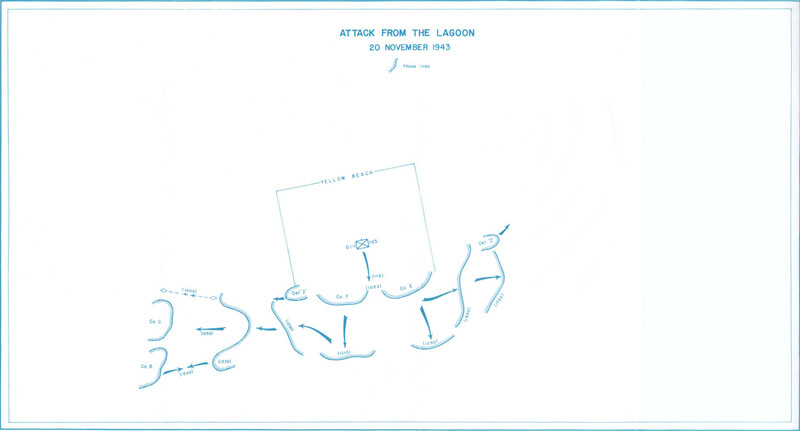 The mission of the 1st Platoon, Company E, was to push directly across the atoll to the ocean shore, while maintaining contact with Company F on its right (Map No. 9a, inside back cover). It was then to turn left and to act as company reserve behind the 2d Platoon. 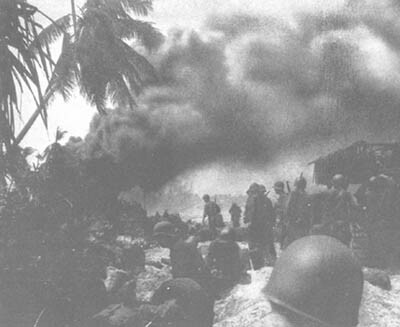 The 2d Platoon was expected to move inland 50 yards beyond the highway, and at that point to swing left and to extend its line to the ocean shore, forming the right platoon of the force by which the eastern half of the island would be seated off from the remainder. One reinforced squad from the 3d Platoon was to mop up the sandspit and the remainder to advance left, occupying a position in the line between the 2d Platoon on its right and Detachment Z on its left. By nightfall Company E was expected to reach a fine along a dirt road crossing the island from King's Wharf, an advance of about 500 yards east of Yellow Beach. With Colonel McDonough directing the drive on the West Tank Barrier, and Major Claire, designated to command Company E, detained in the lagoon while the hulks were under fire, actual command during most of D Day fell to Capt. Bernard Ryan, company commander. The artillery had been called upon to lay a barrage in the area just west of the King's Wharf road. There, the main portion of the 3d Platoon, Company E, was stopped. It ran upon the day's most difficult ground fighting at a position strongly constructed and cleverly disguised, lying directly opposite the sandspit, south of the main island highway. (See illustration, p. 82.) 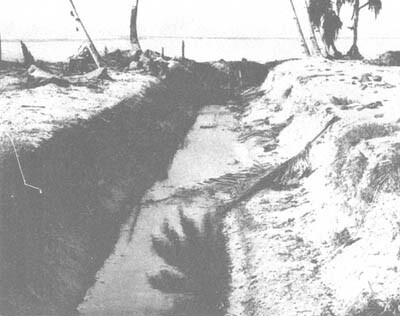 Near the road was a revetment for one of the two Japanese tankettes on the island, with five rifle pits beside it. A few yards east was the position which gave the most trouble. At a bend in the highway was a machine gun, facing west, which delivered enfilading fire upon the 3d Platoon. 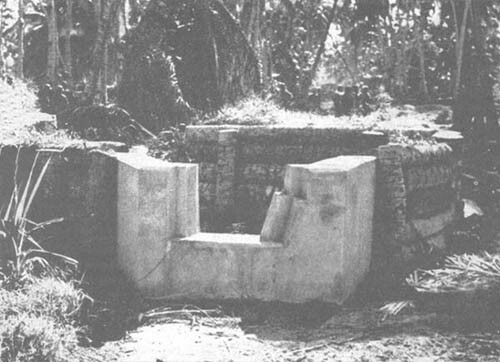 Adjoining the emplacement, to the south, was a large bobai pit. 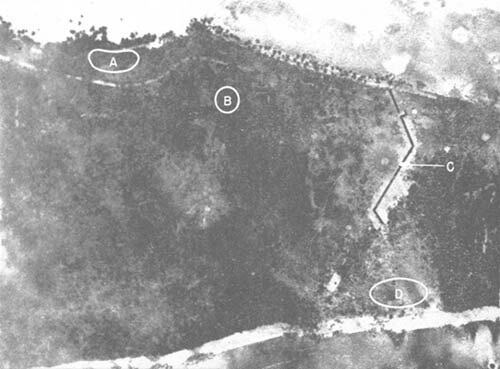 The earth from the pit seemed to have been piled up along its western edge in a curving mound about 8 feet high, extending, as the men discovered, about 35 yards from the machine-gun position to a concrete pillbox nearer the center of the island (Map No. 9, inside back cover). 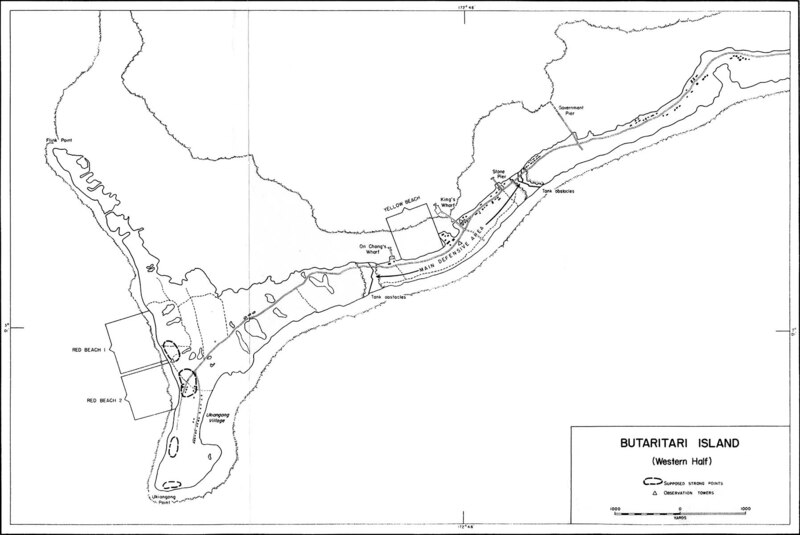 Of the 1st BLT, Companies A, B, and D bivouacked in adjacent areas on the ocean side of the island, west of tire West Tank Barrier. 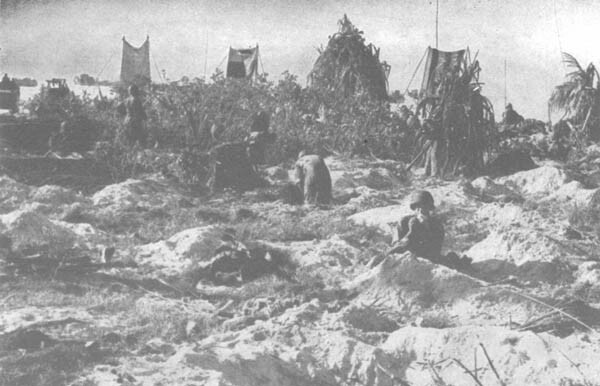 Company C, however, set up its position in the northern half of the barrier clearing, just east of the "pocket" of still active Japanese (Map No. 6, p. 86). 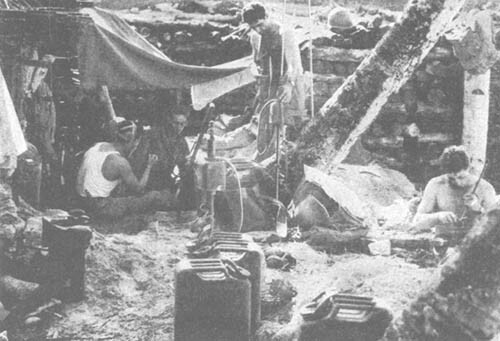 BATTALION MEDICAL AID STATION near Yellow Beach in an old bobai pit, lined with grass and palm fronds. 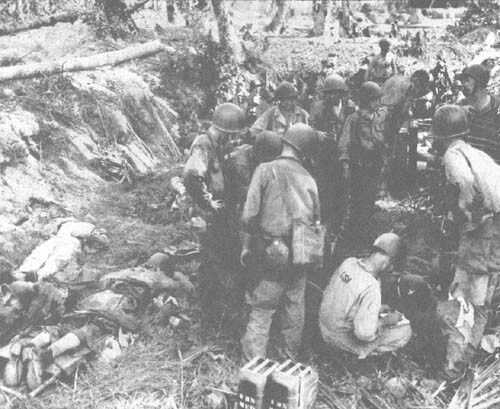 Wounded were taken from aid station to transport until noon of 2d day, when a clearing station and surgical service had been installed on Ukiangong Point to treat them.